Sign up with your checking account or charge card. It costs you $9.99 per month and you get 50 minutes per month (100 minutes if you have a doubler card installed on your phone) and 30 days of activity. This is a great inexpensive monthly phone plan if you want a phone for occasional/emergency use. The 50 minute Tracfone-Value-Plan would be $120 for a year and 600 minutes (1200 minutes with the doubler card $120+$50=$170). 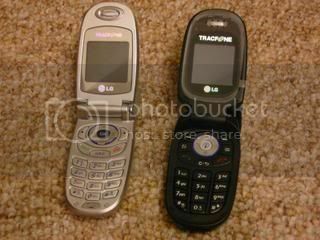 It would be cheaper to buy 2 60 minute cards with phones and extra card deals from the Tracfone.com website. . Install the four 60 minute cards and you will get 12 months of activation time and 240 minutes for $80. If you use the Tracfone Bonus codes with these cards you can up that number of minutes substantially. This would only cost you $20 + $20 + $5 shipping for the $20 card and phone combo deals. This picture shows the LG 3280 and the LG cg225 Camera Phone. Automatically add 30 days and 50 minutes to your first phone for $9.99 and add 30 days and 30 minutes to your other family line phone for $5.99. I have asked a Tracfone Customer Service person and they said the New Minute Doubler card will double these minutes. I do not have personal experience with this so I do not know for sure. If the doubler works your minutes will cost you 10 cents per minute. This is as cheap as you will get tracfone minutes usually. This is a simple Phone number saver. If you let your activation time expire you will lose your phone number. The Lifeline Value Plan is $4.95 for 30 days of service but you only get charged if you run out of activation time. It also allows you to use the "Add a Bundle" plan. If your phone number is very important to you be sure to sign up for this service. How to get 10 cents a minute all the time from Tracfone without hassling with bonus codes or specials. Buy a doubler card and add it to your phone and then sign up for the 50 Minute Value plan. This will cost you $9.99 per month for 100 minutes and 30 days activation time. You will also be able to "Add a Bundle" of 50/100 minutes for 9.99 any time you want. If you have a lot of Activity time left Sign up for the Lifeline Tracfone-Value-Plan which is $4.95 only if you run out of activity time. This will allow you to get the "Add a Bundle" minutes. Sign up for a Tracfone-Value-Plan and you can get the "Add a Bundle deal" any time you want and get 10 cent minutes with the doubler card or 20 cents per minute without the doubler card. Go to Tracfone.com website to sign up for the Tracfone-Value-Plan.